It hasn't just been the election ups and downs. Work has tuckered me out more than usual. I had a mediation on Monday, and I have my first evidentiary hearing on Friday before an administrative law judge. It's sort of the regulatory equivalent of a trial. Instead of live direct testimony, however, you file written direct testimony. The rest is largely the same, though. Cross-examination is still live. I've been prepping witnesses. I've been strategizing. I've been stressing. And today I couldn't stop thinking about Prop 8. Glam said today should be a happy day. I agree. But we couldn't help being dejected about the text underneath the momentous headline. Glam was even more dejected on a personal level. She was talking to her five-year-old son this morning about Prop 8. When she told him it passed, he cheered, "Yay!" She asked him, "Why do you say that? I am sad." He said, "Because it is gross." As hard as Glam is trying to teach her little boy respect and tolerance for all people, it seems that outside forces have already gotten to him. He certainly didn't learn this at home. I shed a few tears behind my closed office door. How could this be? 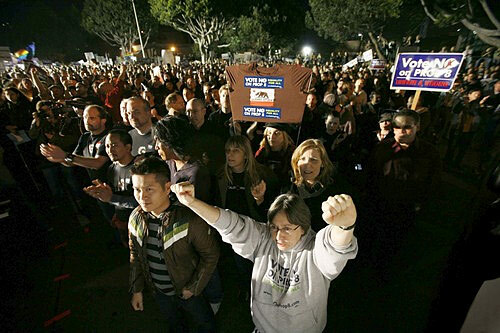 It gives a whole new perspective to photos of rejoicing Prop 8 supporters. Who has won here? "Yay" has never sounded so ugly. Prop 8 proponents often preach that they don't want their children being taught about gay marriage in school. Nevermind that the defeat of Prop 8 would've had no actual bearing on such things. Well, you know what? I don't want children being taught to hate. Tonight I read and re-read all the underlying documents for my evidentiary hearing. I drafted outlines. I highlighted. I took notes. Meanwhile, Sable Crow and insomniac protested in West Hollywood. 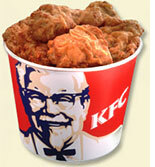 I thought about them as I formulated my plans for my Friday regulatory debut. As important as it was to prepare for my case, I had this nagging feeling that the protest was far more important. This is the end of my despairing. It is time to look forward and to prepare for the long path to right this wrong. A petition for writ of mandate challenging Prop 8 was filed today by a team comprised of a number of groups, including the ACLU and the Green Giant -- yes, my old law firm. I close this post with a poignant story of my own. When my brother and I had dinner with our family earlier this week, we asked our mom how she voted on Prop 8. She said, "No! Of course!" When we asked her why, she responded so simply. Three syllables. So elegant. So true. Prop 8's passage weighed on me heavily all day, too. My fiance and I own a couple of small retail stores - we proudly displayed large "No on 8" signs out front and in the stores in the weeks leading up to the election. There were some customers who took the time to tell us we offended them with our sign - and others, I'm sure, who just won't bother to return. Those signs are now permanent fixtures in both of our establishments. Our opposition to Prop 8 is permanent and those signs will be a reminder of that. I hope those of us who oppose prop 8 can channel our anger and frustration into the movement against it; I hope tonight's protest was only the beginning. This post brought me to tears. When I got to work yesterday morning and found out that Prop 8 had indeed passed, I sat in my office and sobbed. More than one co-worker didn't understand how I could be so upset over a prop. I had to explain to them that this affects my family directly, and even if it didn't, I would still be upset. Discrimination is never okay. One of my co-workers said that 1) she didn't think it was a good idea to teach gay marriage in schools and 2) she didn't know whether gay people choose to be gay. I have no clue why people don't look at their own school experiences and see that marriage was never a unit they studied. Further, I don't understand why there is such a debate on whether being gay is chosen or biological. I tend to think of my own experience discovering my sexuality - I did not consciously choose to be straight. I just am! Why wouldn't the same principles apply to homosexual people? We are NOT that different. I will never understand how people can be so hateful, all in the name of "protecting" marriage, children, and the family. But it's all just a cover for their fear. I am absolutely disgusted and heartbroken that Prop 8 passed. I don't even have the right words, it all makes me so sad. This is a lot to handle all in the same week. I at least hope that your case goes well on Friday! i am sad that you and so many others are so deeply saddened and affected by this. i hope that the rest of your week goes well. such a roller coaster the last 24 hours. I didn't make it to the protest last night. I partly couldn't bear it. I can't imagine how this happened in california. j said they marched all the way to cahuenga and hollywood!!! he sounded so...angry. It's been a crazy week. Hope the weekend is less draining for you. I feel your pain, and it has weighed heavily on me too. I too cried yesterday and watching everyone protest made me feel like I should be there right a long with them. I might be heading out to SF this weekend to join the protests, I just can't stand not doing anything about it and waiting. Thank you for your posts on this subject they are always so well written and speak the truth. I've also been having a rough week. 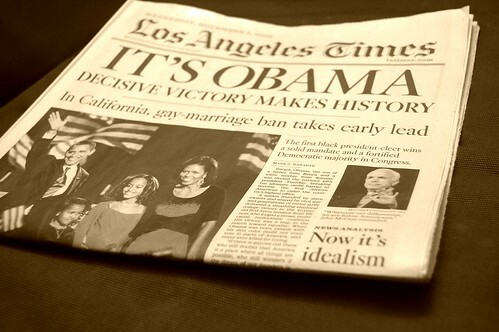 It's so fabulous about Obama, and at the same time, so devastating about Prop 8. Thanks again for your posts on this. I'm so happy that with the birth of the Internet, 20 years from now I will be able to shove that photo of elated looking people down those exact people's throats (because their names are listed right below the photo in the news article) and scream ARE YOU PROUD OF THIS NOW? I am FURIOUS at this point. Seriously, why do people care??? Further, why is it any of our business to decide who others can marry. It's proposterous! Again, furious. I've been reading that the pre-election polls were skewed, because those in favor of Prop 8 were wary of admitting it. Why the secrecy? Why the lack of honesty? It's nothing but cowardice to hide behind the curtain of an election poll booth and vote in silence and shame. Because they KNOW. They KNOW Prop 8 is unfair and that discrimination, in the name of anything or anyone, is NEVER OK. I cried too. For myself, my gay friends and family members, and for children like Glam's son who will grow up learning that hatred is OK. I was about 16 years old before I realized that other children were taught prejudice or hate in their homes. I am not done hoping my own children will never have to make that revelation. And I did cry last night when I called my mother and thanked her for teaching me that God created us all equal. I'm trying to stay positive in thinking that, just like every other discriminatory behavior in society, this will change someday as well. It's been a long, emotional week. I hope it ends well with you for the trial. That is so sad, especially about Glam's child. :( I so hope my children won't feel that way, but who knows how the outside world, their friends, and their rebellious nature will make them react. I don't even want to get into this but I am very disappointed as well. It's downright discrimination. i couldn't agree more. it's simply unfair. The hubs and I had the gym to ourselves tonight, so we spent the entire time tearing apart arguments for Prop 8. It energized our workout. If I still had any power from my gypsy ancestory, I would curse every "yes" voter with a gay child or grandchild. I would love nothing more for them to look their own offspring in the eye and inform them that they are responsible for the way things are. we have to have hope - without it, we have nothing. it will be a long battle but one that will be won. people have become tolerant over time - sadly, this is an ugly part in US history but one we will overcome!